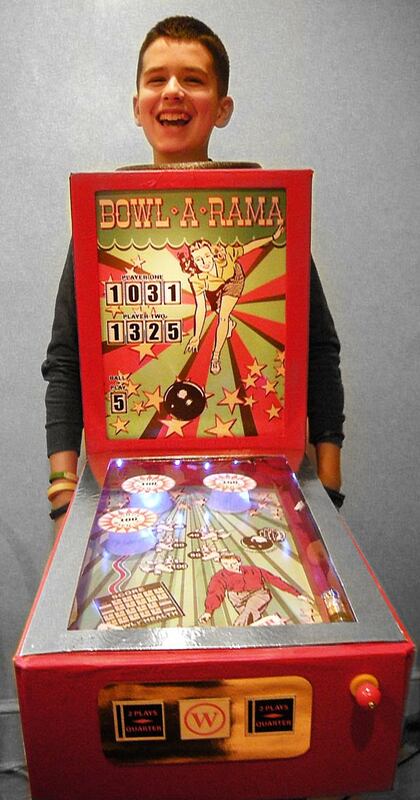 This year’s exploration of coin operated machinery – a bowling themed pinball machine. Happy Halloween everyone!!! This entry was posted in Halloween, Holiday and tagged bowling, coin operated Halloween costume, craft, DIY, Halloween costume, handmade, pinball machine. Bookmark the permalink. Thanks Smite – you have no idea how difficult it was finding a lady bowler in shorts!!! You’re too picky JT. I could help you find a girl that’s right up your alley! I don’t have time to spare. You’ve got to stop living life in the fast lane. I’ve thought about it, but I just can’t split. You’ll end up in the gutter. I hope you’re saving the costumes. How did he hold up the whole machine and hold his trick or treat bag? This one is pretty large so it may be consigned to the deep or receive a Viking’s funeral. It was actually fairly light, and Lloyd got around better than we thought he would. Stay tuned for Friday’s post. There will be some behind-the-scenes/making-of shots and commentary! There was a tie that strapped him to the back of the box so it didn’t shift around. It hadn’t been added when we shot that photo. We did save the Seeburg Jukebox costume – I couldn’t bear to see it end up in a landfill.